Once a year, representatives of all Beneficiaries as well as all ESRs of EuroNeurotrophin come together for the Annual Network week. These Network weeks not only give the people involved in EuroNeurotrophin the possibility to meet in person, but to exchange experiences, in particular for the ESRs, and to discuss achieved tasks and future goals. Therefore, this coming together of the consortium serves mainly to promote the active exchange of knowledge and experience, to ensure the project is on track and to offer Network-wide training to the ESRs. The 1st Network Meeting took place from 3rd to 12th December 2018 and was hosted by the EuroNeurotrophin Coordinator, The National Hellenic Research Foundation in Athens, Greece. The 8-day meeting consisted out of three main elements; The Scientific Project Meeting, the mid-term review meeting with the EuroNeurotrophin Project Officer and the ESR training week. The scientific project meeting brings together the ESRs and the PIs to discuss achieved tasks and future goals. Therefore, this coming together of the consortium serves mainly to promote the active exchange of knowledge and experience, to ensure the project is on track and to offer Network-wide training to the ESRs. The Mid-Term Check Meeting is a mandatory meeting between the Research Executive Agency (REA) and the project consortium. The aim of the meeting is to assess the fulfillment of all scientific, training, management and networking aspects set out within EuroNeurotrophin. 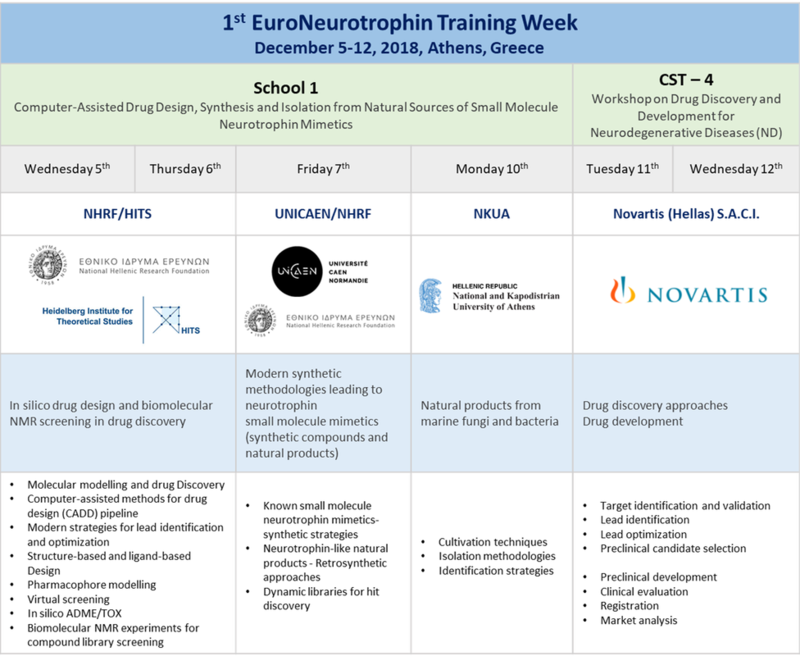 The Training week covers courses, workshops and schools for both transferable and technical skills as well as training on drug discovery and development for ND. The aim is to train the 14 ESRs not only on scientific relevant topics but also to strengthen their knowledge in important transferable skills to highly skilled researchers with a deep understanding of neurotrophins and their function, comprehend all steps of drug discovery and development for Neurodegenerative diseases (ND), and possess the necessary skills to translate results into novel new therapies.